csnow closed T7801: Login Screen Freezes on Boot. No terminal access. as Resolved. Thank you for your help. I have resolved this issue by reinstating the DNS nameservers manually which prevented me from using Eopkg. csnow added a comment to T7801: Login Screen Freezes on Boot. No terminal access. . I have replaced the corrupted files on my box with the ones on my live boot. This has fixed all corrupted files and packages without needing internet. I have these logs from checking eopkg. Girtablulu added a comment to T7801: Login Screen Freezes on Boot. No terminal access. . Stable. Can’t get into tty with ctr alt f2. I installed libinput and fusuma before this. stable or unstable repo? Can you get into TTY? What did you do before this boot? csnow raised the priority of T7801: Login Screen Freezes on Boot. No terminal access. from High to Needs Triage. csnow triaged T7801: Login Screen Freezes on Boot. No terminal access. as High priority. JoshStrobl added members for Triage Team: joebonrichie, kyrios123. JoshStrobl added a member for Triage Team: ermo. DataDrake added a comment to T7224: 4.19 kernel update broke my USB-C to displayport connection. There's a patch in 4.19.2 for this iirc. t3g added a project to T7224: 4.19 kernel update broke my USB-C to displayport connection: Software. t3g edited projects for T7224: 4.19 kernel update broke my USB-C to displayport connection, added: Hardware, Triage Team; removed Lacks Project. JoshStrobl removed a member for Triage Team: • ikey. DataDrake added a member for Triage Team: Girtablulu. DataDrake lowered the priority of T6930: Trackpad and Touchpad problems after the latest updates - Lenovo Thinkpad L480 from Unbreak Now! to Needs Triage. Do not change priority. We will set it as needed. Zaff triaged T6930: Trackpad and Touchpad problems after the latest updates - Lenovo Thinkpad L480 as Unbreak Now! priority. ZachBacon added a comment to T6828: VisualBoyAdvance-M segment faults when trying to load a ROM file after latest update. Closing as resolved. I'd like to see more consideration be put in from the VBA-M devs in ensuring existing configurations more gracefully upgrade / are supported for newer releases. Having our users experience these issues is not ideal. JoshStrobl closed T6828: VisualBoyAdvance-M segment faults when trying to load a ROM file after latest update as Resolved. nekoseam added a comment to T6828: VisualBoyAdvance-M segment faults when trying to load a ROM file after latest update. I assigned this to you seeing as you're the maintainer and developer of VBA-M. Marking as Needs More Info, @nekoseam can you confirm whether or not you're on rel 13? nekoseam updated the task description for T6828: VisualBoyAdvance-M segment faults when trying to load a ROM file after latest update. Well it's resolved on my end as far as I can tell, if @nekoseam can confirm that would be great. JoshStrobl assigned T6828: VisualBoyAdvance-M segment faults when trying to load a ROM file after latest update to ZachBacon. JoshStrobl added a comment to T6828: VisualBoyAdvance-M segment faults when trying to load a ROM file after latest update. ZachBacon placed T6828: VisualBoyAdvance-M segment faults when trying to load a ROM file after latest update up for grabs. nekoseam added a project to T6828: VisualBoyAdvance-M segment faults when trying to load a ROM file after latest update: Triage Team. JoshStrobl closed T6764: Removing cups from packaged manager also removes other programs as Invalid. worldwar345 edited projects for T6764: Removing cups from packaged manager also removes other programs, added: Software, Restricted Project, Triage Team; removed Lacks Project. AI_I_EN added a comment to T6706: Screen not getting locked on suspending and the screenlock settings greyed out. JoshStrobl closed T6706: Screen not getting locked on suspending and the screenlock settings greyed out as Invalid. AI_I_EN edited projects for T6706: Screen not getting locked on suspending and the screenlock settings greyed out, added: Triage Team, Restricted Project; removed Lacks Project. sirredbeard edited projects for T6479: Enable Support for Sierra AirPrime EM7455 LTE card, added: Triage Team; removed Lacks Project. sirredbeard closed T6385: GUI video jumbled after recent update on Solus guest in VirtualBox as Resolved. kyrios123 added a comment to T6385: GUI video jumbled after recent update on Solus guest in VirtualBox. sirredbeard added a comment to T6385: GUI video jumbled after recent update on Solus guest in VirtualBox. 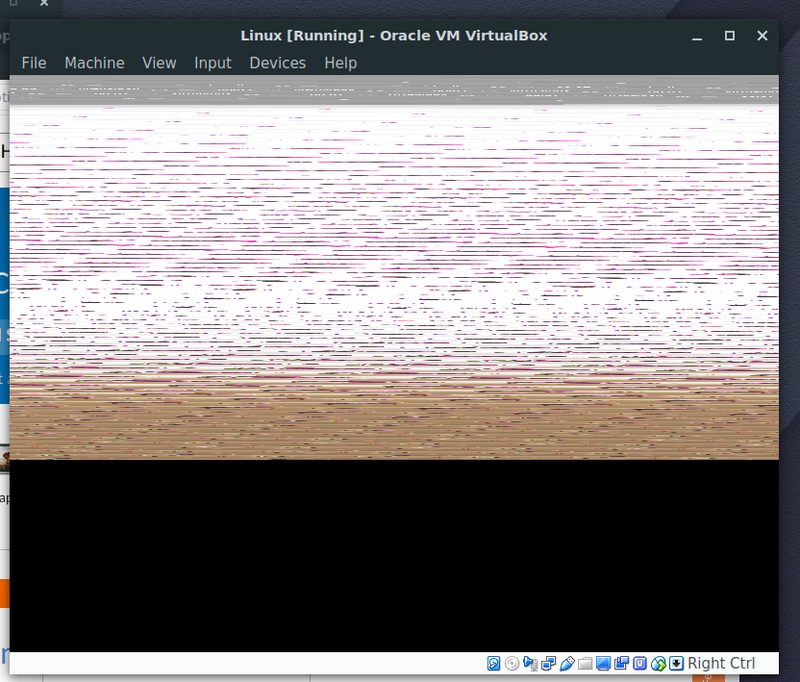 There is the log from VirtualBox up until the point the GUI loads and the video is jumbled. sirredbeard added a project to T6385: GUI video jumbled after recent update on Solus guest in VirtualBox: Triage Team. nils added a project to T5551: USB printer not found (Epson XP-625): Triage Team. waddon1 added a comment to T5851: Intermittent Network Disconnect. classyjoe edited projects for T5851: Intermittent Network Disconnect, added: Triage Team; removed Lacks Project. vanyo placed T5829: Different users with different languages in Solus 3 up for grabs. vanyo claimed T5829: Different users with different languages in Solus 3.
maverick1 edited projects for T4894: My Laptop Doesn't Boot Up at One Try, added: Triage Team, Hardware; removed Lacks Project. lethed added a project to T4898: Razer Blade Stealth freezes: Triage Team. JoshStrobl moved T4427: Ethernet not coming back after unplug from Backlog to Networking on the Hardware board. 3luelotus added projects to T4797: Radeon GLX problem after rolling update on AMD Hybrid: Software, Triage Team. mramish added a comment to T4588: libcolord is missing in Solus 3 Mate installation. kyrios123 added a comment to T4588: libcolord is missing in Solus 3 Mate installation. Did you add your printer via the print settings or via hplip ? mate-user updated the task description for T4588: libcolord is missing in Solus 3 Mate installation. mramish edited projects for T4588: libcolord is missing in Solus 3 Mate installation, added: Triage Team; removed Lacks Project. kyrios123 added a comment to T4489: youtube-viewer doesn't play videos in VLC. actually VLC doesn't play any youtube video (but it works fine with other video streaming services like dailymotion for example). joebonrichie changed the status of T4489: youtube-viewer doesn't play videos in VLC from Open to In Progress. JoshStrobl placed T4427: Ethernet not coming back after unplug up for grabs. 9xkBwvMP assigned T4427: Ethernet not coming back after unplug to • ikey. JoshStrobl added a member for Triage Team: Justin. 9xkBwvMP added a project to T4427: Ethernet not coming back after unplug: Triage Team. 9xkBwvMP closed T4303: System froze upon wifi disconnect. After reboot, budgie does not seem to start as Resolved. 9xkBwvMP added a comment to T4303: System froze upon wifi disconnect. After reboot, budgie does not seem to start. Hmm, that seems to have found some issue with python and then fixed it, not sure how that worked. Can't reproduce this any more, so closing. sunnyflunk added a comment to T4303: System froze upon wifi disconnect. After reboot, budgie does not seem to start. 9xkBwvMP edited projects for T4303: System froze upon wifi disconnect. After reboot, budgie does not seem to start, added: Triage Team, Software; removed Lacks Project. Schyken added a comment to T4283: (GNOME) Removing "Workspace Indicator" in Software Center also removes all GNOME Shell extensions. Ah, I'm picking up what you're putting down. Would that explain why I can't find the gnome-shell-extensions package in SC, and that's the package that gets removed when removing Workspace Indicator from the SC? • ikey added a comment to T4283: (GNOME) Removing "Workspace Indicator" in Software Center also removes all GNOME Shell extensions. Well its more likely the appstream data is cockeyed and you're actually removing the GNOME Shell package, which exposes the Workspace Indicator as a plugin ..
Schyken edited projects for T4283: (GNOME) Removing "Workspace Indicator" in Software Center also removes all GNOME Shell extensions, added: Triage Team; removed Lacks Project. • ikey closed T4135: Left panel overlaid on maximised window using 2nd display as Resolved. • ikey added a comment to T4135: Left panel overlaid on maximised window using 2nd display. jwong78 added a comment to T4135: Left panel overlaid on maximised window using 2nd display. So the one that the icons are on is the primary display, and the strut reservation is on the wrong screen? Apologies. I did get a little confused on where to post this. I followed the links from https://solus-project.com/support/, but can now see where this should have been reported. jwong78 edited projects for T4135: Left panel overlaid on maximised window using 2nd display, added: Triage Team; removed Lacks Project. mintspider added a comment to T4101: VLC running issues. Craig-toyoracer added a comment to T4101: VLC running issues. sunnyflunk added a comment to T4101: VLC running issues. To confirm, this is the output when it did crash? sorry recap - when playing DVD enter the 'Play Movie button' from menu and 50/50 if it plays or crashes. Craig-toyoracer added a project to T4101: VLC running issues: Triage Team. anaknaga edited projects for T4071: Firejail & Thunderbird doesn't work out of the box, added: Triage Team; removed Lacks Project. sixtyfive added a comment to T4002: FR: deal with BlueTooth headphones offering multiple devices. sixtyfive added a project to T4002: FR: deal with BlueTooth headphones offering multiple devices: Triage Team. sixtyfive reopened T2587: PulseAudio Equalizer as "Open". Morcas edited projects for T3874: Wine doesn't seem to be finding libgnutls-32bit, added: Software, Triage Team; removed Lacks Project. jebofponderworthy created T3700: icedtea-web-plugin is lacking the plugin (IcedTeaPlugin.so). euoar updated the task description for T3560: (bug) tcl/tk wish8.6 not working under Solus mate desktop. euoar created T3560: (bug) tcl/tk wish8.6 not working under Solus mate desktop. Seeder101 added a comment to T3450: Budgie Lockscreen Keyboard Input locks users out of profile . @Seeder101 Solus Budgie uses LightDM, not GDM. moriel5 added a comment to T3450: Budgie Lockscreen Keyboard Input locks users out of profile . @JoshStrobl I personally think that @Seeder101 is partially correct, that this is a (obviously LightDM, not GDM) upstream issue, as this had first happened to me on Ubuntu, rather than on Solus. JoshStrobl added a comment to T3450: Budgie Lockscreen Keyboard Input locks users out of profile . I can attest to this having happened to me when my keyboard was set to Hebrew. sunnyflunk merged task T3487: Doflicky showing the wrong driver for my graphics card (nvidia) into T2389: Nvidia driver (DoFlicky install wrong driver). Seeder101 created T3487: Doflicky showing the wrong driver for my graphics card (nvidia). • iamnumber4 created T3473: Files 3.24.0 - not mounting SSHFS (sftp) to /run/user/<uid>/gvfs. solusitor added a project to T3450: Budgie Lockscreen Keyboard Input locks users out of profile : Triage Team. kyrios123 added a subtask for T3424: autofs issue: T3425: autofs --with-systemd. noko62 created T3424: autofs issue.